You hear a whisper from a language long forgotten, this is The Password. It acts as the key to a non-dimensional realm leftover from the days of multiverse prohibition. 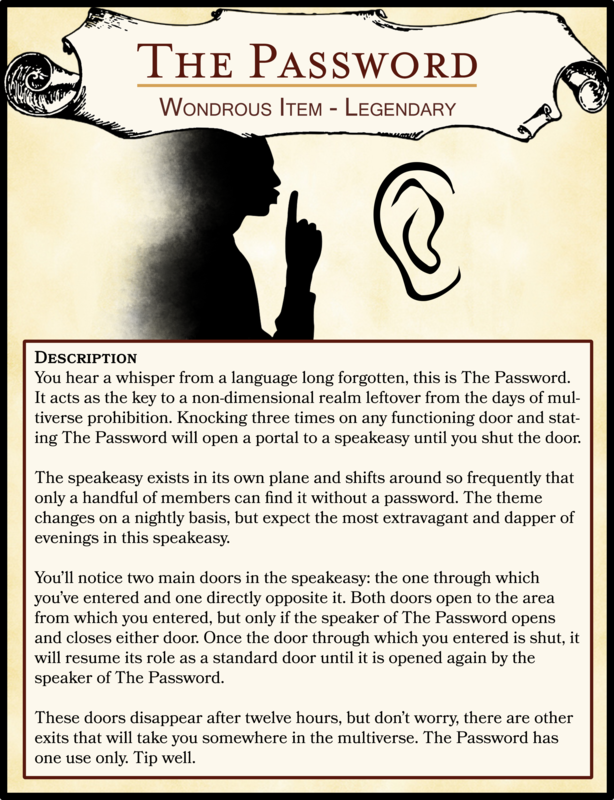 Knocking three times on any functioning door and stating The Password will open a portal to a speakeasy until you shut the door. The speakeasy exists in its own plane and shifts around so frequently that only a handful of members can find it without a password. The theme changes on a nightly basis, but expect the most extravagant and dapper of evenings in this speakeasy. You’ll notice two main doors in the speakeasy: the one through which you’ve entered and one directly opposite it. Both doors open to the area from which you entered, but only if the speaker of The Password opens and closes either door. Once the door through which you entered is shut, it will resume its role as a standard door until it is opened again by the speaker of The Password. These doors disappear after twelve hours, but don’t worry, there are other exits that will take you somewhere in the multiverse. The Password has one use only. Tip well.